Well Peyton has taken to dressing herself in the morning! These last few month’s her individuality is really shining through. And I try to encourage it as much as possible. I think it’s wonderful she likes to be unique. She likes to mix patterns and colors. I want her to be herself and dress the way she thinks is fun and funky. But the other morning she took it to a new level. She found a wig I was sent to review and she really latched on to it. For some reason she was drawn to it. She LOVED it! And once it was on her head I could not get it off. I wasn’t really concerned with her wearing a wig around or out and about. That was not the issue. But it was going to be 89 degrees today and I knew a wig would compound the heat. That was my concern. But rather than fight with her I let her wear it to school. When we got to school all the little kids thought it was so cool! Even though this is sold as a mouse wig, Peyton decided it looked more like a cat wig and she was calling herself Sheriff Callie. Mind you Sheriff Callie does not have long wavy hair. But in Peyton’s mind this worked for Sheriff Callie. Peyton wore her wig most of the day. When they went outside she did concede and leave it in her cubby. But as soon as they came back in she put it back on. She was able to put it on all by herself. 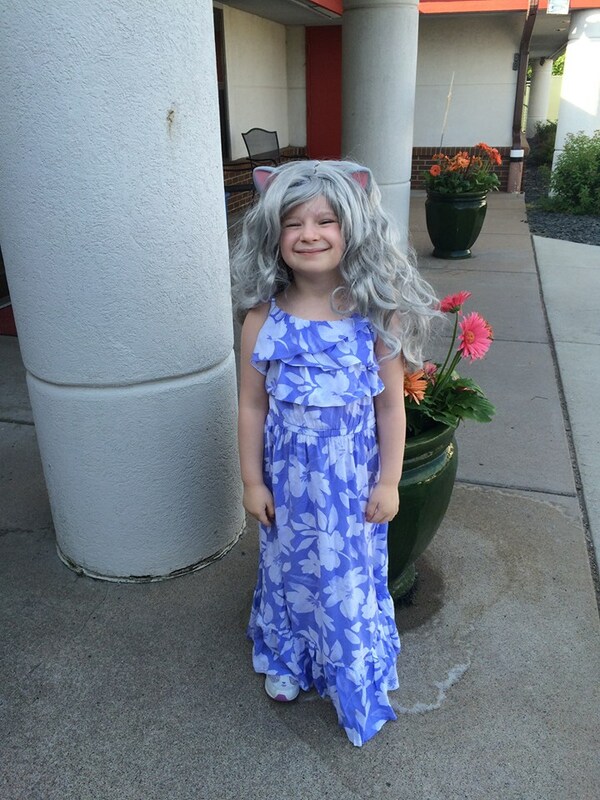 So my daughter went to school, dressed in an adorable dress and a wig. Oh well. I’m sure this will not be the wildest thing I ever see her wearing to school! I received Grey Mouse Wig complimentary for evaluation purposes. This piece is not the review, however it was mentioned so I am disclosing. Regardless, all opinions expressed are still 100% my own. I am disclosing this in accordance with Federal Trade Commission 16 CFR, Part 255 Guides Concerning the Use of Endorsement and Testimonials in Advertising.